Other Bartletts immigrated to the colonies during the Great Migration, not just our Robert Bartlett. Our Society is dedicated to documenting and preserving the genealogies of the descendants of Robert Bartlett who arrived on the Anne in 1623. However, we outline some of the other Bartlett immigrant ancestors below. RICHARD BARTLETT came to Newbury, Massachusetts in 1634 from Wiltshire, West Sussex, England. He brought a “Breeches Bible” with him, the first in America. Richard was a shoemaker by trade. He had been born about 1575 in England and died 25 May 1647 in Newbury, Massachusetts. His was perhaps the most prolific of all the Bartlett families in America. His estate was proved and recorded in Ipswich deed book, Vol. 1, leaf 25. John Savage, in his Genealogical Dictionary of New England Settlers, calls him the brother of Christopher Bartlett, but documented evidence supporting this contention has not been discovered to date. 3. Thomas, born 22 January 1614/15 in England. i. Elizabeth, born 13 May 1672. She married Joshua Brown. Elizabeth died 14 February 1697.
ii. Abigail, born 14 April 1674. She married Abraham Merrill. Abigail died 12 August 1744.
iii. Samuel, born 28 March 1676. He married Abigail Wells. Samuel died 16 May 1753.
iv. Sarah, born 7 July 1678. She died 10 March 1744.
vi. Richard born 23 February 1679. He married 4 November 1706, Abigail Ropes. He died 3 November 1753.
i. Hannah, born 8 November 1674. She married John Ordway. ii. Richard, born 20 October 1676. He married 12 April 1699, Margaret Woodman. iii. John, born 3 September 1678. He married 18 November 1702, Mary Ordway. He died 1741.
iv. Samuel, born 8 May 1680. He married Elizabeth Bartlett. Samuel died 20 November 1685.
v. Daniel, born 8 August 1682. He died in Newbury, Essex Co, Mass. vi. Joseph, born 18 November 1686. He married first, 5 December 1717, Elizabeth Tewksbury and secondly 27 April 1721, Sarah Hoyt. Joseph died 1754 in Newton, Rockingham Township, New Hampshire. He was a soldier under the command of Capt. Wainwright, during the French & Indian War. He was captured during the assault on Haverhill, 29 August 1708, and held for four years. He wrote a narrative on his captivity. vii. Samuel, born 2 May 1689 in Newbury, Essex Co, Mass. He married 2 January 1715/16 in Newbury, Mass., Judith Coffin. Samuel died in Newbury, Mass. viii. Stephen, born 21 April 1691 in Newbury, Mass.. He married 18 December 1712, Hannah Webster. Stephen died 10 April 1773 in Amesbury, Mass. ix. Thomas, born 14 July 1695, He married 18 November 1718, Hannah Moody. x. Mary, born 15 September 1697. She married. ___Hill. c. Thomas, born 7 September 1650 in Newbury, Essex Co, Mass. He married 24 November 1685, Tirzah Titcomb. Thomas died 6 April 1689. His widow married secondly James Ordway. i. Elizabeth, born 7 Aug 1686 and died 15 Oct 1689.
ii. Tizra, born and died 29 March 1689.
d. Abigail, born March 1652/53 in Newbury, Essex Co, Mass. She married 27 May 1700, John Emery. Abigail died 1723.
i. Mary, born 17 October 1681. She died 29 March 1682.
ii. John, born 24 January 1683.
iii. Mary, born 27 April 1684.
iv. Nathaniel, born 18 April 1685.
v. Dorothy, born 23 August 1686.
vi. Sara, born 27 November 1687.
vii. Hannah, born 18 December 1657. She died 17 June 1676.
viii. Rebecca, born 23 May 1661.
f. Hannah, born 18 December 1657 in Newbury, Essex Co, Mass. She died 17 June 1698.
g. Rebecca, born 23 May 1661. She married 5 September 1700, Isaac Bayley. Rebecca died 1723. 5. Christopher, born 25 February 1622/23 in Ernley, West Sussex, England. He married first, 16 April 1645, Mary __, and secondly 17 December 1663, Mary Hoyt. Christopher died 15 March 1668/69 in Newbury, Essex Co., Massachusetts. a. Mary, born 15 October 1647.
b. Ann, born 28 September 1650.
c. Martha, born March 1652/53. d. Christopher, born 11 June 1655 in Newbury, Essex Co, Mass. He married 29 November 1677, Deborah Weed. He died 14 April 1711.
e. Jonathan, born 13 September 1657 in Newbury, Essex Co, Mass. He died 28 December 1657 in Newbury, Essex Co, Mass. 6. Anne, born 26 February 1624/25 in England. CHRISTOPHER BARTLETT was in Newbury, MA by 1635. John Savage, in his Genealogical Dictionary of New England Settlers, calls him the brother of Richard Bartlett of Newbury, Massachusetts, but documented evidence supporting this contention has not been discovered to date. 1.Mary, b. 15 Oct 1647. She died young. 2. Ann, b. 28 Sep 1650. 3. Martha, b. Mar 1653.
a. Christopher, b. 26 Feb 1679.
b. Deborah, b. 23 Jun 1680.
c. Mary, b. 17 Apr 1682.
d. Ann, b. 29 Mar 1684.
e. Lydia, b. 19 Apr 1688.
f. Hannah, b. 2 Nov 1689.
g. Sarah, b. 23 Oct 1691.
h. Abigail, b. 7 Nov 1695.
i. Samuel, b. 16 May 1698.
j. Mehitable, 18 Oct 1691. 5. Jonathan, b. 5 Jul 1657. He died aged 2 years. 6. John, b. 13 Sep 1665, who died aged 3 months. a. Gideon, b. 18 Dec 1661.
b. Mary, who d. 29 Mar 1682. 2. Mary, b. Dec 1679. 2. Nathaniel who died unmarried. 3. Abigail who married 17 December 1657, John Stebbins of Northampton, MA. 4. Deborah baptized. 8 March 1646, married John Cowles Jr. of Hatfield, MA. 1. Hannah who was buried 26 Aug 1639. 2. Mehitable, b. 15 Jul 1640. She married 7 Jan 1658, Henry Spring. 3. Hannah, b. 6 Aug 1642. She married 19 Jan 1668, John Kendall. 4. Bathshua, b. 17 Apr 1647. She married 23 Nov 1671, John Applin. 5. Abial b. 28 May 1651. She married 24 Oct 1669, Jonathan Saunderson. My immigrant Bartlett surname ancestors were George & Mary (Cruttenden) Bartlett, who married in Guilford, Connecticut on 14 Sep 1650. They were among the Guilford founders, settled in 1639 by the Whitfield Congregation of English Puritans. The original settlers at Guilford hailed primarily from the area at the junction of the English counties of Kent, Sussex, and Surrey. There is a considerable amount of misinformation on the internet to be found on George and Mary, and the intent here is to clear up some of the misconceptions. The exact English origins of George Bartlett are as yet unknown. The earliest known record of George on this side of the Atlantic is in the first court record from “Guilford Plantation,” dated 14 August 1645, wherein he is listed as a witness in the court proceedings, per Genealogies of Connecticut Families, from the New England Historical & Genealogical Register, selected and introduced by Gary Boyd Roberts, Genealogical Publishing Co., Baltimore, 1983, p 102. Many internet sites give a birth year for George of 1630, but for George to have been a witness in the Guilford court in 1645, he must first have already attained the age of majority – 21 years under English Common Law. This means that the latest possible birth year for George would be 1624 or before. 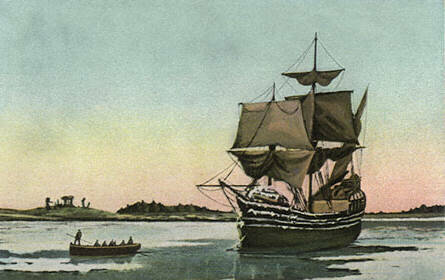 It is known that several young men who were either attached to existing households in some capacity or who were not yet of legal age, were among the original settlers at Guilford, although not signers of the Guilford Plantation Covenant, which heads of households signed aboard ship in route to America during the summer of 1639. (In many New England Puritan communities, stray bachelors and maidens were prohibited from living alone, and were assigned to live under the discipline of existing households). George Bartlett may very likely have fit into this category, as he did not marry until 11 years after the founding of the settlement, and since he gradually passed through positions of increasing responsibility in local government. One would presume George Bartlett to have been one of the Guilford founders, owing to the central location of his homelot. His name was tenth in the Guilford “Book of Terriers” (i.e. a survey of landed property), with a homelot of 4 ½ acres (GCF p 102). The site was situated on the southwest corner of Guilford Green. It is logical to assume that during the first decade or so of the settlement, all those individuals having homelots in the center of the village were members of the original 1639 group, with the community expanding outward from the geographic core as later settlers arrived or children of the original settlers grew to adulthood. Frankly, if George Bartlett were not part of the original 1639 Guilford group – for instance, if he came to Guilford directly from England or from elsewhere in New England at a later date as some researchers suggest – it is impossible to believe that he would have been assigned a homelot with frontage on Guilford Green, as that land would already have been taken by the first settlers, and would not have been available to late arrivals. Moreover, Puritan immigration into New England virtually stopped after 1640 due to the English Civil War, so it is doubtful that George Bartlett arrived after that. Moreover if the supposition is correct that George Bartlett was part of the 1639 group and he was allotted his homelot in the first division of land at Guilford Plantation, which would appear to be the case, it argues for an even earlier birth year for George than 1624. Once again, for George Bartlett to own land, he would have been required to attain the age of majority of 21 years. The records of the first allotments of land are no longer existent, and may have been destroyed in a house fire, per the History of Guilford & Madison, Connecticut, by Bernard Christian Steiner, reissued by The Guilford Free Library, Guilford, CT, 1975, p 31. The Whitfield Congregation arrived first in New Haven, where they remained temporarily until the land for what became Guilford village could be purchased from the local Native Americans. The final land transaction was finalized in 02 February of 1641-2, per HGM p 33. Assuming that George Bartlett was at least 21 years old by that time, it pushes his birth year back to – maybe – 1620. From a tactical standpoint therefore, as far as genealogical research into George Bartlett’s English origins is concerned, it would make sense to look for his birth record in an English parish in Kent, Sussex, or Surrey in a range of – say – 1618-1624. The earliest known census of Guilford, after the Plantation Covenant, is a list of male inhabitants dated 1650, wherein George Bartlett is listed as one of 28 “freemen,” which at that time meant that the individual had passed the rigorous requirements for church membership. This included a public testimony relating the particulars of ones “conversion experience” whereby one first became conscious of receiving saving grace through faith in Christ (in order for the church leadership to verify the applicant’s status as a born again saint), knowledge of both Scripture and established Puritan doctrine, and good moral character at least as far as it could be evidenced by outward behavior. Following the establishment of the Guilford church on 29 June 1643, two classes of Guilford residents emerged- freemen who were church members in good standing, and planters who were not members. Only church members could vote or hold office, with the result being that the church and local government of early Guilford were essentially one-and-the-same. The “Freeman’s Charge” (presumably a public reading of the rights and responsibilities of freemen requiring an oath of fidelity to the same) was first given to those settlers at Guilford who qualified, including George Bartlett, on 22 May 1648. George Bartlett was said to have been a man of some education, as were most of the early Guilford settlers, who was held in high regard in the community. He was frequently called upon to testify in the Guilford Court, which would tend to indicate that he had a high level of credibility in the eyes of his neighbors. He gradually progressed through various public offices in Guilford, including: overseer of highways on 22 May 1649, Marshal of the Plantation on 09 June 1651, townsman on 09 June 1653, Secretary of the Plantation and also Deputy of the Particular Courts on 05 June 1662, Lieutenant of the Train Band (local militia) on 06 July 1665 and further, he was named one of the first two Deacons of the Guilford Church, (probably in June 1665). Finally, on 23 April 1665, George Bartlett and John Fowler were chosen as the first representatives from Guilford to the General Assembly of Connecticut, following the demise of the New Haven Colony as a separate governmental entity in late 1664- early 1665. In 1650, George Bartlett married Mary (Cruttenden), daughter of Abraham Sr. and Elizabeth (Usborne) Cruttenden. Abraham Cruttenden Sr. was one of the heads of households who signed the Guilford Plantation Covenant aboard ship in 1639. Tragically, both George and Mary died untimely deaths in 1669, leaving several small children. 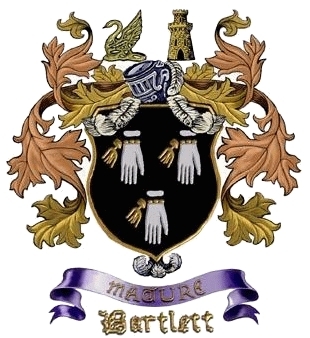 It is not known who raised the orphaned Bartlett children, but most likely it was one or more of Mary (Cruttenden) Bartlett’s brothers or sisters, who lived in Guilford and survived her. Mary (Cruttenden) Bartlett’s English origins, on the other hand, have been documented. Mary was the daughter of Abraham Cruttenden, one of the Guilford founders who was a signer of the Guilford Plantation Covenant. Prior to his immigration into Connecticut, Abraham Cruttenden was for several years a resident of Hawkhurst in Kent. Both Abraham Cruttenden and William Chittenden, two of the founders of Guilford, attended the Parish Church of St. Laurence With All Saints in Hawkhurst, (still in operation today). Baptismal entries for six children of Abraham Cruttenden were recorded in the Hawkhurst Parish Register, cited as follows: Thomas on 22 February 1624 (obvious proof that Abraham Cruttenden was not born in 1610 as various researchers claim), Abraham Jr. on 24 December 1626, Isaack on 01 November 1629, Mary on 29 April 1632, Elizabeth on 30 November 1634, and Hannah on 25 January 1637. These same six children of Abraham Cruttenden can be placed in Guilford – plus Deborah, who was presumably born following the family’s arrival in New England (GCF p 502). Although the name is sometimes rendered as Crittenden, it was recorded as Cruttenden in the Hawkhurst Parish Register. Most genealogical works identify Mary (Cruttenden) Bartlett’s mother as Mary Hinkson. The Hawkhurst Parish Register does not support this, however. The mother’s name is not given for the first four Cruttenden children baptized in Hawkhurst, and in the case of the last two, the mother is identified as Elizabeth. GCF, p. 502 states concerning Abraham Cruttenden the immigrant, “It is said that he came from the county of Kent in England and had been a neighbor of William Chittenden, whose widow he afterwards married”. The proof of this contention is found in the Hawkhurst Parish Register, on the first page encompassing the period 25 March 1636 through 25 March 1637. On that page are entries for Thomas baptized 20 November 1636, son of William Chittenden & Joana his wife, and for Hannah baptized 25 January 1637, daughter of Abraham Cruttenden & Elizabeth his wife. Abraham Cruttenden married the widow Joanna Chittenden on 31 May 1665 in Guilford, per GCF p 502. Martha A. Lynes published an article in the New England Historical and Genealogical Register, Vol. 160, No. 639 July 2006 “The Ancestry of William Chittenden of Guilford, Connecticut” in which she identifies the wife of Abraham Cruttenden of Guilford, Connecticut, as Elizabeth. At that time she was unable to determine Elizabeth’s maiden surname. (Joan Sheafe Chittenden was the second wife of Abraham Cruttenden, hence the connection to the Chittenden article.) That Elizabeth was the given name of Abraham’s first wife was determined by the baptism records of his children in Hawkhurst, Kent, England. (It is fitting to mention that this information had already been uncovered by a professional genealogist in England, John Dagger, who I had hired some twenty years earlier. I received his report in November of 1986, and have shared it with Cruttenden researchers ever since). In the January 2011 (Vol. 165, No. 657) issue of the NEHGR, an article by Leslie Mahler entitled “The English Ancestry of Elizabeth Usborne, First Wife of Abraham Cruttenden of Guilford, Connecticut,” pp. 15-26, identifies Elizabeth’s surname as Usborne. An extensive search in local wills yielded the essential information to develop Elizabeth’s ancestry. She was baptized (christened) on 13 Jan 1597/1598 in Staplehurst, Kent, England. Her parents were Thomas Usborne and Ann Bridgeland. She was married to Abraham Cruttenden by 1623. Elizabeth’s connection to Abraham Cruttenden is proven by the will of her brother Peter Usborne of Staplehurst “dated 2 November 1632, proved 26 Nov. 1632, naming ‘Thomas Abraham Isaack and Mary as the children of ‘Elizabeth Crittenden my sister.” These were the four oldest children of Abraham Cruttenden baptized in Hawkhurst. Mahler goes on to trace Elizabeth Usborne’s family back several generations to Osbert Usborne b. abt. 1425 in Staplehurst. These two articles are a must read for any descendants of Abraham Cruttenden of Guilford. Moreover, the 22 February 1624 baptismal date for Thomas Cruttenden, the eldest child born to Abraham Cruttenden & Elizabeth Usborne, renders the 1610 birth year shown for Abraham Cruttenden in many sources quite impossible. Abraham’s wife Elizabeth Usborne was baptized 13 Jan 1597/8 in the parish of Staplehurst, Kent. Abraham Cruttenden was probably the Abraham son of Thomas Cruttenden, baptized in the parish Etchingham, Sussex 30 Sep 1599. Hawkhurst and Cranbrook by the way, are located in between Staplehurst and Etchingham on the A229. The internet is a wonderful tool for genealogists, enabling us to pool the research of many individuals on both sides of the Atlantic, but once misinformation gets posted to it, the erroneous info takes on a life of its own, and becomes difficult to correct. Hopefully this short article will clear away some of the fog concerning George and Mary (Cruttenden) Bartlett of Guilford, Connecticut. 1. Elizabeth, b. Mar 1652. She married 29 Aug 1677, Abraham Fowler. 2. Mary, b. 1 Feb 1654. She married 10 Jul 1673, Nathaniel Stone. 3. John, b. 9 Nov 1656. 4. Hannah, b. 5 Nov 1658. 5. Daniel, b. 14 Dec 1665.
a. Mary, b. 18 May 1694.
b. Abraham, b. 4 Mar 1697.
c. Joseph, b. 24 Oct 1699.
d. Timothy, b. 25 Mar 1702.
e. Ebenezer, b. 6 Nov 1705. 7. Deborah, b. 1668. She married 16 Mar 1687, John Spinning. a. John, b. 12 Sep 1664.
a. Deborah, b. 3 Apr 1666.
b. Benjamin, b. 21 Jun 1668. He died young. c. Isaiah, b. 9 Dec 1670. He died soon after. d. Isaiah, 26 Jul 1672.
e. Ephraim, b. 17 Jan 1674.
f. Jehoida, b. 2 Nov 1675.
g. Benjamin, b. 5 Dec 1677. 3. Hepzibah, b. 14 Jul 1646.
a. Martha, b. 28 Jul 1674. 5. Mehitable, b. 11 May 1651. GEORGE BARTLETT was of Scarborough, Maine (then Massachusetts), by 1663. He died in 1674. His daughter Elizabeth married Nicholas Baker of Marblehead. NICHOLAS BARTLETT was in Kennebunk, ME, in 1651, then in Salem, MA, in 1700. HENRY BARTLETT was of Braintree, MA, and fought with Captain Johnson in the Narragansett War. JOHN BARTLETT was in Newport, MA, by 1639. 1. John, b. 11 Feb 1666. 1. Mary, b. 17 Oct 1681. She died aged 5 months. 2. John, b. 24 Jan 1683. 3. Mary, b. 27 Apr 1684. 4. Nathaniel, b. 18 Apr 1685. 5. Dorothy, b. 22 Aug 1686. 6. Sarah, b. 27 Nov 1687. 7. Hannah, b. 13 Mar 1689. 8. Nathan, b. 23 Dec 1691. 9. Abigail, b. 12 Aug 1693. 10. Alice, b. 18 Mar 1695. ROBERT BARTLETT of Marblehead, MA, may have been a brother of John above. He was there by 1674 and married Mary Walton. 1. Mary, b. 17 Feb 1672.
a. Thomas, b. 25 Jul 1697.
b. Benjamin, b. 24 May 1699.
c. Elizabeth, b. 8 Mar 1709 and d. the next year. d. Joseph, b. 8 Apr 1703.
e. Ebenezer, perhaps his son. 3. Mary, the other twin, b. 5 Mar 1673. 4. Elizabeth, b. 5 Feb1677. She perhaps married James Prentiss. 6. Sarah. She married 1708, Jonathan Willard. WILLIAM BARTLETT was in New London, CT, by 1647 and died by 1657, leaving a widow, Susanna, but no children. ROBERT BARTLETT was in New London, CT, in 1658 and was the brother of William above mentioned and heir to his estate. He married Sarah ______ who died first, and he d. 1673. He had no children and gave his wealth to the town. There also was a Richard Bartlett in Newbury, MA, who married Margaret Woodman, 12 April 1699, and had sons, Richard, b. 27 June 1700, and Joseph, b. 18 Feb 1702. He undoubtedly fits into one of the families above but his exact placement was not stated in the references cited. The same can be said for John Bartlett “the 4th” who married Prudence Merrill 25 Nov 1702. 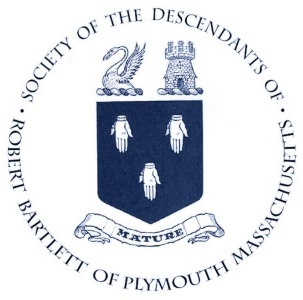 It is easy to see that there were many Bartletts in New England other than the descendants of Robert Bartlett of Plymouth. Even if you don’t descend from Robert of Plymouth, you are welcomed to join the Society as an Associate Member. Perhaps someday we will discover the links that tie all these Bartletts together.